New Item! Expected to Ship 06-10-2019. 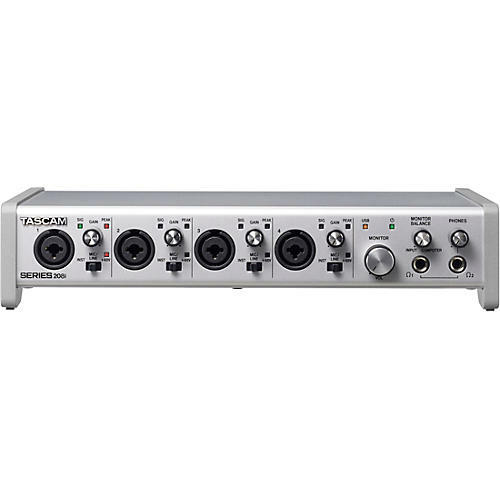 The TASCAM SERIES 208i 20-In/8-Out USB Audio/MIDI Interface provides professional quality, expandability, both internal and bundled eﬀects processing, internal mixing, external software control, and more for studio, home, and live recording. With a new look, including an angled tabletop design and large, easy-to-grab knobs, TASCAM sets a new standard for mid-grade audio interfaces. It all starts with the best sound: TEAC and TASCAM have more than 60 years of high-grade audio design experience. TASCAM Ultra-HDDA (High Deﬁnition Discrete Ampliﬁer) mic preamp circuitry guarantees transparent natural tone with ultra-low noise. A new-generation TASCAM audio interface engine delivers high-deﬁnition, 24-bit/192 kHz recording and solid stability. A DSP input and output mixer are complemented with digital reverb, compressor, phase invert, and 4-band EQ for each channel. Having these processors included internally eliminates all latency issues and takes the load off the computer allowing the PC/Mac to process the audio more efficiently.